I called this recipe "pizza buns" for lack of a better title. Actually, it can be any flavor filling that you like. 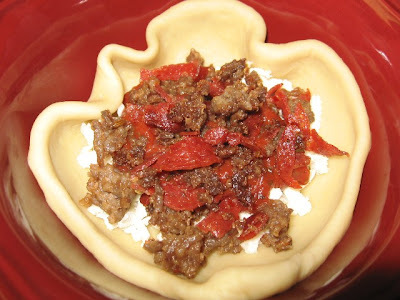 The "magic" is in the dough; it is on the slightly sweet side but (as unlikely as it sounds) it compliments a savory filling perfectly. Originally, this was a dough that my German Russian ancestors used for a hot and savory ham and sauerkraut sandwich. I decided to experiment with various fillings and they have been such a big hit with Hubby that I've made them twice this week. I've made calzones for years, but these are so much better...not bready or doughy at all and the dough raises just enough (as it bakes) to make the perfect sandwich...light, crispy and delicious. Mix the warm water (hottest out of your tap) with the sweetened condensed milk, vegetable oil and sugar and salt. The hot tap water will cool down in temperature once it is mixed with the oil and milk (so it won't hurt the yeast). Next, whisk in the egg and the yeast. Let this sit for several minutes until the yeast looks well dissolved. 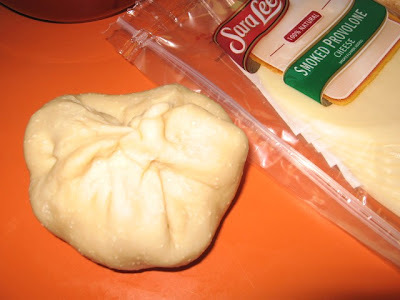 NOTE: When you first mix up this dough, it will seem stiff and dense. Don't let that freak you out...just follow the instructions and it will bake up beautifully. Once it is well dissolved, mix in the flour (using a stand mixer is easiest) and mix with dough hook on medium speed until smooth (about 5 minutes or so). Place in a bowl sprayed with vegetable spray and cover with plastic wrap. Let this sit in a warm place for an hour or until it is double in size. Remove from the bowl and cut into 8 pieces (makes 8 sandwiches). Roll each piece out into an 8 inch circle. 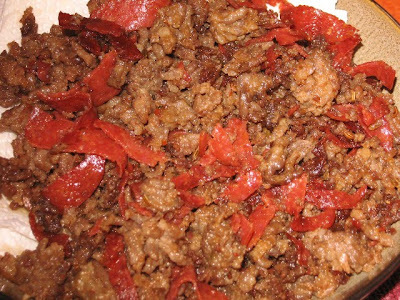 For pizza filling, put the ingredients in IN THIS ORDER: about ¼ cup of cheese in center of circle; top with a little pizza sauce and some toppings. This dough is a dream to work with...it stretches without tearing and sticks together beautifully when it comes time to "pinch it shut". Cover with plastic wrap and let them sit for 20 minutes. Bake in pre-heated 350F oven for 20 minutes. When they come out of the oven, brush them with butter. Aren't they pretty? Be careful when you first bite into them...they are SO hot inside. Ham and Cheese is great too !! 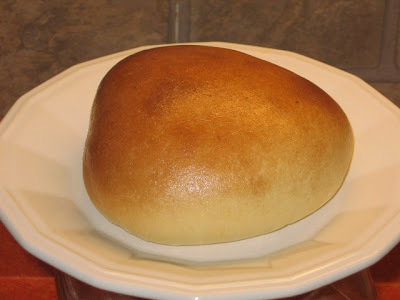 NOTE: Remember that the order, in which you put ingredients into this bun, is important because after you pinch the bun shut, you turn it upside down. So...if you put the cheese in FIRST, when it melts, it will melt down over the meat which is what you want rather than the melted cheese being UNDER the meat. Does that make sense? NOTE: These sandwiches stay super hot for an unbelievable length of time, so they would be excellent for a potluck or picnic (they are also excellent at room temperature). 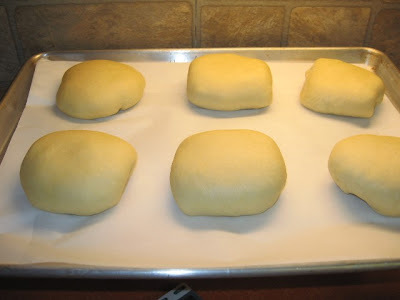 This dough recipe makes 8 big sandwiches, but you could easily make them smaller for snack size. NOTE: I have plans on making these, using Sloppy Joe filling, barbecue beef filling, bacon and egg filling and much more. I can see a million possibilities. NOTE: The fully baked leftovers (full size) reheat, beautifully, in a preheated 350F oven in 20-23 minutes and taste exactly like they did the first time they came out of the oven. Making these ASAP!!!! They look so yummy and I think they would be great for lunch boxes. Thanks for sharing. I've never made bread with sweetened condensed milk before, but these look amazing. My kids would love these! Wow these looks amazing! I love the variations on this recipe. Great post! Oh wow.... You know Coleen...I think I would just LOVE to sit in your kitchen there with you... visiting and hopefully snacking on all those wonderful things you make for your family. My ancestry is German Russian too so I am thinking we would get along famously! BTW...how is the 'race'? Everyone okay? What a great idea and looks terrific! 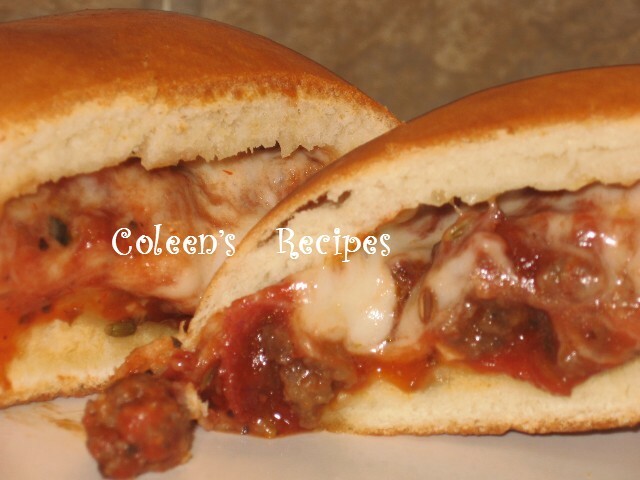 These pizza buns look so good, Coleen..I'm going to make these soon...and oh the possibilities of the fillings..
Alright! This is definitely a recipe I need to try! It's perfect for a weekend lunch. Because it can be filled with anything all of us can have what we want! No complaints. When I read that this made 8 sandwiches I wimmediately thought about soggy leftovers but I'm glad to read that they can be reheated and be just as good. I want these! Like now! Oh those look really good! I can just imagine all the different fillings you could try with these. I like the ham and cheese...delicious!!! Coleen, what an unusual recipe, with sw.condensed milk. They look fabulous! I like a sweet dough and the sweetened condensed milk is very interesting! First time ever seeing it! These remind me of Dim Sum in San Francisco, only with an Italian twist! What a great idea! 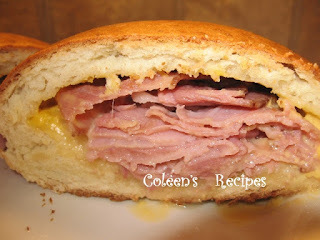 Coleen ~ I love your buns! I couldn’t resist ;). Sweetened condensed milk in the dough? Wow that sounds delicious. The pizza flavored one makes me drool! Oh my goodness! These look fantastic...and I love the dough ingredients! Sweet condensed milk? Awesome! how fun! i'm so intrigued with the dough that has sweetened condensed milk, how fun! Can't wait to try these. They look so appetizing and yummy. Thank you for the recipe. Hope you are staying warm. I just must move to Alaska, that's all there is to it. Can I saw OMGosh! Coleen, once again, you have found and shared a TREASURE!! I'm with Katy, I want to move to Alaska just for your food! These look amazing and I've bookmarked it! Thanks Coleen. These look awesome Coleen! I bet these would win over anyone:D I can see both my children and husband loving these and the dough looks amazing! This is a recipe that is sure to please! Everything about this looks and sounds like a perfect lunch or dinner treat. Definitely bookmarking this one. Your dough sounds divine with the SC milk! Love it! they llok so good too! Made these today with ham and cheese. It was a hit with the 3 kids and the hubby! I love those rare occasions when everybody at the table loves the same meal. Score one for team Mom! OK so heres a total duh! I'm on your site so often I thought I started following you long ago. I guess not so I'm your newest follower!!! Okay, I made these again today. This time I stuffed some with The Pampered Chefs recipe for cheeseburger salad (minus the lettuce and croutons). It was so good. Rave reviews from kids and hubby. Then, just for fun, we made one with Nutella, bananas and mini marshmellows. Delish! I just love this dough! I have made these three times now, and every single time I get raves. I left out the extra sugar the last two times - with no big change, taste etc. I stuffed them the second time with good (cooked)bacon, lightly scrambled egg and jack cheese. YUMMO This is my new *go to* recipe!! 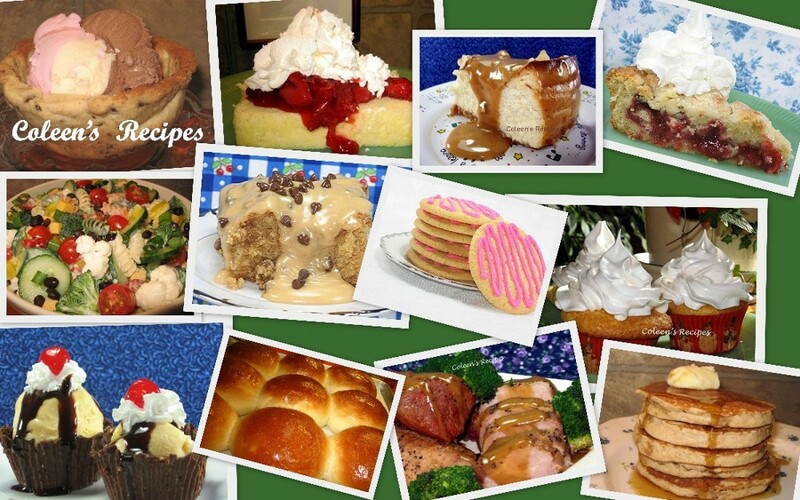 Thanks so much for your delicious recipes!